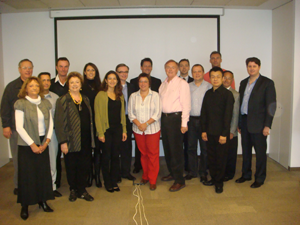 On 25 October 2009 the International DanceSport Federation (IDSF) Working Group on VISION 2012 met for the first time in Sant Cugat, ESP, to discuss the further proceedings in trying to have IDSF evolve into the World DanceSport Federation. "That this meeting directs and encourages the Presidium to continue working on VISION 2012, and to establish a working group including representatives of Associate Members, representatives of other key IDSF Member Bodies and representatives of other dance disciplines. The meeting directs that this working group shall consider all the information and questions raised in the 2009 IDSF Forum in Macau and also any responses or questions received from IDSF Members during or after the Forum. The working group’s work will be communicated on a regular periodic basis to all IDSF Member Bodies, and all IDSF Member Bodies are encouraged to provide their comments in writing." All organisations present support the World DanceSport Federation concept (Vision 2012) as worked out on 25/10/2009 in Sant Cugat. All organisations agree to create a working group. The working group is mandated to continue analysis based on information presented at the meeting with the intention of creating the WDSF. Provide information on financial activities. Each organisation is to consider the list of obstacles and send proposed solutions to the IDSF Office. Download the PowerPoint presented and modified during the Working Group Meeting! Get the free PowerPoint Viewer 2007 from Microsoft! Founded in 1957, the world governing body for DanceSport is currently made up of 88 national member bodies and three associate members. Its mission is to regulate, administer and develop DanceSport for the benefit of millions of athletes at every level and around the world. The International DanceSport Federation (IDSF) is recognised by the International Olympic Committee (IOC). IDSF seeks to expand its mission further and sets out to serve an even broader consituent base as the World DanceSport Federation (WDSF). Click here to go to the WDSF website! With a view to the future!